Nørgård Mikkelsen is one of Denmark’s largest communication and innovation agencies. The company specialises in brand design, marketing and advertising. It is also well known for its big advertising campaigns in both print and digital media for FMCG, retail and B2B organizations, such as Fiskebranchen and Rynkeby Foods. When a company rebrands, it has to ensure that its new branding is consistent across all platforms, whether that is on business cards, letterheads, websites, or even emails. Promoting brand in an email signature is very important for a lot of companies, which is why it’s important all users’ have a consistent signature. Nørgård Mikkelsen needed a solution to help centrally manage and control all Office 365 users’ email signatures after a rebrand and website refresh. “Nørgård Mikkelsen had recently rebranded and changed the company domain, so we needed to ensure all signatures were consistent in-line with these changes. 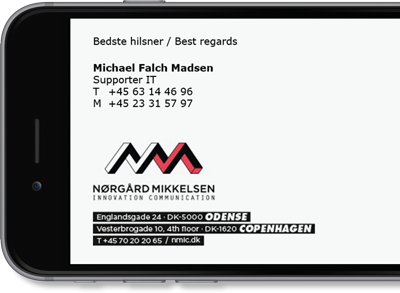 That’s when we decided we needed a centrally-managed solution for our Office 365 email signatures,” said Michael Falch Madsen, IT Support at Nørgård Mikkelsen. One of the benefits of Office 365 is being able to access its products on any device, whether that is a mobile or a Mac. For that reason, Nørgård Mikkelsen needed an email signature solution that would work with Office 365 on both Mac and Windows computers. “It was important to find a solution that worked with our mixed Mac and Microsoft environment. Signatures needed to be applied to emails no matter what device we were using,” Mr Madsen continued. It didn’t take long for Nørgård Mikkelsen to setup Exclaimer Cloud - Signatures for Office 365 and promote its new brand and website. “We can now easily apply signatures to everybody in the company using Exclaimer Cloud - Signatures for Office 365, including adding promotional banners for campaigns whenever we need,” concluded Mr Madsen.